featuring KICKR CLIMB support and LED indicator lights next to the flywheel, as pictured below. Please contact support for questions on older versions. 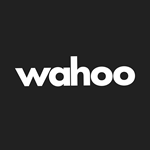 Wahoo Fitness is a running, cycling, and fitness app that leverages your smartphone to deliver data-driven power that fuels your training and fitness goals. Get the app now to register your KICKR SNAP and get cranking. 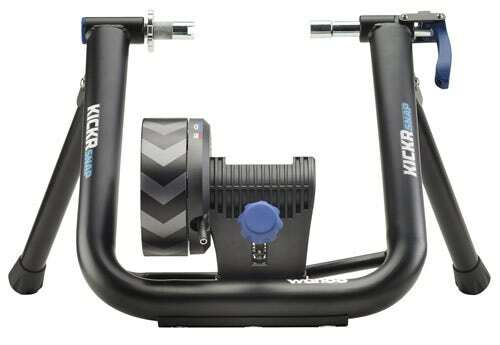 Wahoo KICKR SNAP is compatible or adaptable with most bike styles and types. However, exclusions may include various single speed, track, recumbent, and some Thru Axle bikes. Mountain: 26", 27.5" / 650b, 29"
Still unsure? Contact support to further check compatibility and adapters for your bike. The Wahoo KICKR SNAP is designed to work with the Wahoo Fitness app which supports devices running iOS 9.0 and newer. The Wahoo KICKR SNAP is designed to work with the Wahoo Fitness app which supports most Bluetooth® compliant Android devices running Android version 4.4 KitKat or newer. The Wahoo KICKR SNAP supports various Windows and Mac applications with Bluetooth and/or ANT+ capabilities. Note: the Wahoo Fitness app (required for some important updates) is only available on iOS and Android mobile devices. 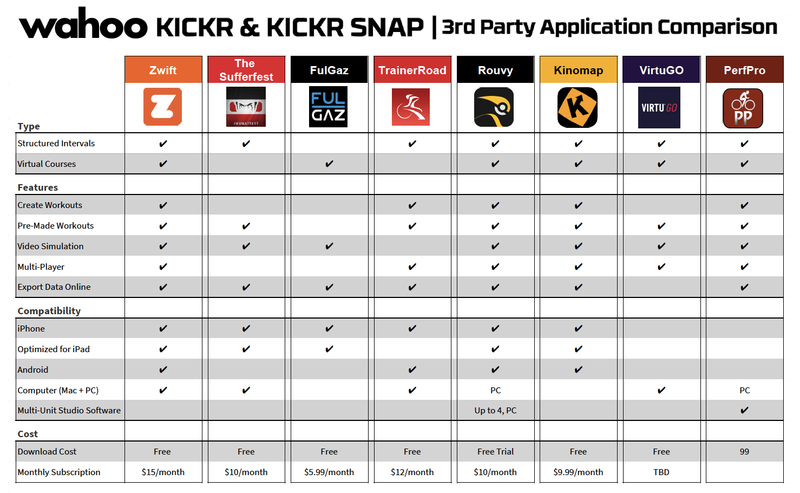 The Wahoo KICKR SNAP is compatible with many 3rd party iOS, Android, Windows and Mac apps. For a list of confirmed compatible 3rd party apps, see the chart at the end of this guide. Always keep your tire clean and free of debris to extend its lifespan. Your KICKR SNAP itself requires minimal cleaning and maintenance if dirt or grime collects. If cleaning is needed, use a moist, soft cloth, avoiding dripping any moisture into the KICKR SNAP itself. Also avoid using strong cleaning agents as they may damage or reduce the lifespan of your KICKR SNAP. The KICKR SNAP comes with legs folded to minimize transportation and storage size. Select a stable, level surface with sufficient room for trainer and bike. Retain packaging for future storage or transport. Open the legs by pivoting the legs outward until fully extended. Bicycles using the 12x142mm thru axle standard require this adapter (sold separately). Please see the video below for installation. If this is your first time pairing, take a moment to register your KICKR SNAP. 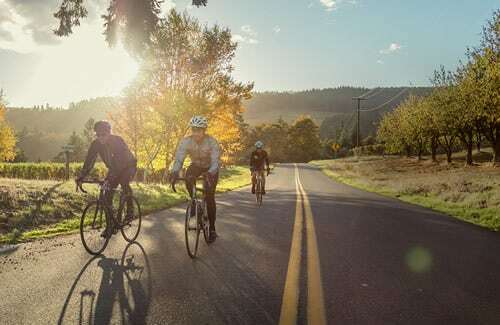 For the smoothest ride, be sure to update your firmware if prompted as well. You'll also want to configure additional settings here like wheel size to match your bike. Lastly, you can perform a spindown from this page to calibrate your KICKR SNAP on first use and before each ride as recommended thereafter. After saving, tap the KICKR SNAP once again and select "Spindown" to calibrate your KICKR SNAP - if prompted to perform a Factory/Advanced spindown, follow the steps on your screen to ensure accurate readings and functionality. For additional information, see the Spindown/Calibration section below. Once a spindown is complete, your KICKR SNAP is ready for action! To use your KICKR SNAP, start a workout in one of the profiles you marked the KICKR SNAP active for. Swipe right within a workout to access detailed KICKR SNAP controls and workout modes. For more details on workout modes see What Are the Different Modes on My Smart Trainer? If this is your first time pairing, take a moment to register your KICKR SNAP. This screen also allows you to customize your wheel size and other settings to match your bike for accurate readings. You’ll also need to calibrate your KICKR SNAP before each ride by performing a spindown, for best results (see the spindown section below for details). It's important to update your KICKR SNAP as well by following these instructions. Once saved, select "Spindown" - you may be prompted to perform Factory/Advanced spindown on first use. Please follow the steps on your screen to ensure accurate readings and functionality. For additional information, see the Spindown/Calibration section below. Your KICKR SNAP is now paired and ready for action! To use your KICKR SNAP, start a workout in one of the profiles you marked the KICKR SNAP active for. Swipe right within a workout to access detailed KICKR SNAP controls and workout modes. For more details on workout modes see What Are the Different Modes on My Smart Trainer? From virtual courses to structured wattage workouts, these apps meet even the most demanding training needs. 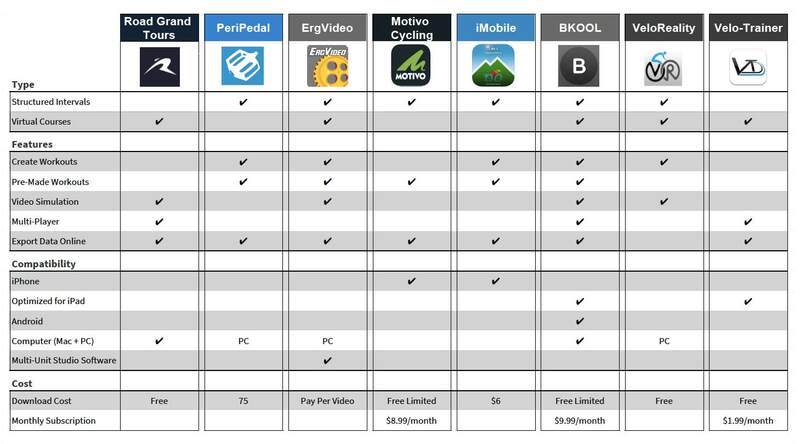 Download this KICKR App Comparison Chart in PDF format. Have more questions? Visit support.wahoofitness.com for additional support.